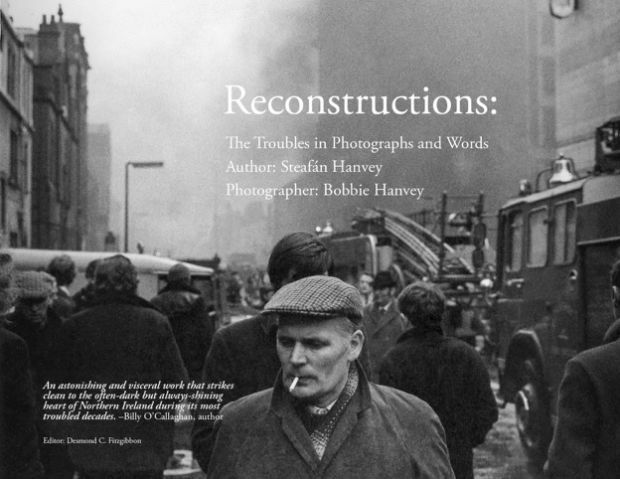 In Reconstructions, these photographs take on even greater resonance when set in context by Bobbie’s eldest son, singer-songwriter and poet, Steafán Hanvey. Inspired by the photographs, he often witnessed coming to life in the darkroom, Steafán’s memories of a childhood less ordinary are presented in a lyric poetry filled with startling imagery and insights that capture the wit, cadences, anguish, and dreams of the people of Northern Ireland. Two years back, my da emailed me a black-and white photograph he’d found in the National Archive of Ireland, of Main Street in Brookeborough, his home village in Co Fermanagh, at the turn of the 20th century. I used to spend my holidays down at my Granny Hanvey’s in the same village. No sooner had I received the photo than I had written a poem about my stays with Granny Hanvey. Within 20 minutes, I’d sent it back to my da. I was aware that I had a collection of memories that would have been very similar to his own as a child. Perhaps I was trying to impress upon him our shared experience. Happily, he reacted positively and the idea for Reconstructions, my first collection of poetry, was born. Having just one month earlier become a father myself for the first time, I was enjoying a breather from a prolonged period of touring my second album Nuclear Family and its artistic corollary, a multimedia performance called Look Behind You!™ A Father and Son’s Impressions of the Troubles through Photograph and Song, which happily brought our work to new and distant audiences. On tour, there was a lot of waiting around time, spent on planes, buses and trains, perfect opportunities to scribble down, a line here, and there. Curating, producing, and eventually touring Look Behind You!™ had shown me that I had several channels of expression before me. The project’s multidisciplinary nature told me that my Bachelor and Master’s degrees in literature and international politics, which I’d shelved in an effort to focus on a career in music, were not entirely in vain. As opposed to seeing my education as something to fall back on, it felt like I was starting to fall forward, into it. Things were opening up, even if words were still the primary focus. During the recording of my sophomore album, Nuclear Family – an album that meditates on the constructive and destructive forces inherent in most families and relationships – I began sifting through my memories and experiences and realised that the public and political face of Northern Ireland was pressed hard against the window of my private and personal world. In short, my family couldn’t be explained in isolation – context, though not everything, was a significant something. As an artist, that something had always troubled me, and making Nuclear Family made me realise that despite the fact that I had never written explicitly about Northern Ireland, Northern Ireland had written me. After years of living by the maxim “Whatever you say, say nothing”, I felt it was time to say something. Quite surprised at how easily the memories made their way down the pen and onto the page, I thought a photo-poetry book would be an interesting and challenging project to embark upon, so I got writing. Although I had been working with words in one form or another for most of my life, this experiment and process proved to be a different animal altogether – different to anything I had previously produced. 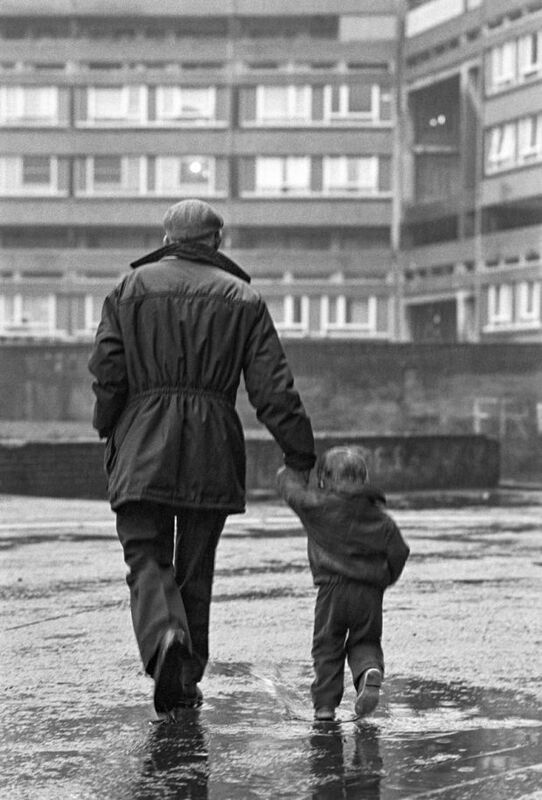 I then started to revisit some of my father’s iconic photographs from the Troubles, with the intention of producing a poem for each. In the end, the photos were part-inspiration, part-confirmation, in that I reacted to some and wrote new poems, whereas others complemented pieces I’d written at earlier stages of my life. Growing up in “the house anomaly built” meant that I was present at the conception of many of these photographs. I witnessed their act of becoming, as it were, and marvelled as they developed a life of their own in chemical trays and beyond. I pegged many of them on the drying-line myself and often had a hand in the framing before they took up residency on the walls of our home. Sometimes, after having been out in the wee hours on the latest adventure, I’d put the photographs on the day’s first buses to their pre-arranged collection-point, ready for whatever newspapers happened to be carrying them that day. I watched them take on other lives too – on record covers, on book covers, inside the books themselves, and now on my own book cover. Portals to a childhood, these images were there as much for me growing up as I was for them. We all look at photographs differently; we see new things every time we revisit them, details we may have missed first time around, which I suppose is why we have the phrase “one look is worth a thousand words”. My da conceived these photographs and I hope that my words, responses and memories do them and their taker – my fathographer – the justice they deserve. I also hope that in my presentation of each “reconstruction” that I have afforded the less-fortunate – those who lost their lives, and those who were hurt and are hurting still – their due respect. Steafán Hanvey was born in Downpatrick, Co. Down and is an artist and musician. In addition to producing two albums, he has directed and toured a multi-media performance, Look Behind You! 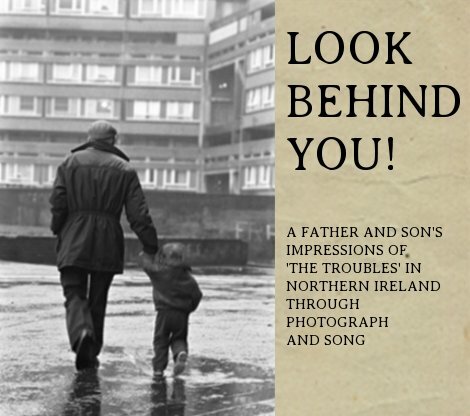 A Father and Son’s Impressions of The Troubles Through Photograph and Song, incorporating songs, spoken word and projections from his father’s collection. Steafán is currently producing his fourth studio album and his first feature-length documentary film. In fine company in the people’s republic of Cork!